Don’t get my wrong, as much as I love the 80’s and moderately enjoy dancing, dancing on a TV show sounded more like a nightmare to me than a fun Saturday afternoon. Fast forward to a couple weeks ago when I was beginning to draft my new things list, and trying to think of doable ideas that would take me out of my comfort zone. I went to my mom and asked if she wanted to do Dance Party again, but this time, I would go with her. Not surprisingly, she said yes, but I don’t know who was more shocked that I was asking her to join me on Dance Party, my mom, or me. 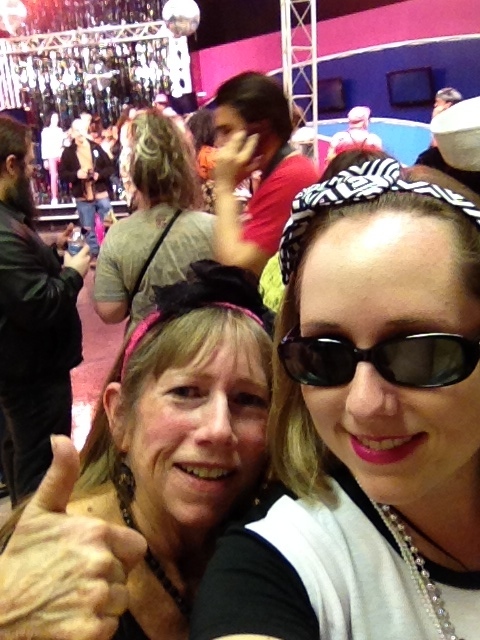 So this morning, I got up at 6am to get into my 80’s gear and makeup, drive to SF, and wait 3 hours in line outside the KOFY studio for the first taping of the new season of Dance Party. When we got there, my mom pointed out all the regulars as they began to show up, and there are a lot of regulars who go to every single taping. From their costumes to their dance moves, they really get into it, and they make somewhat shy people like myself stand out as extreme wallflowers. When we finally got inside and started filming/dancing, I was trying to get out of my head and just have a good time, but I’m not sure how successful I was (alcohol would have really helped me today). I did have fun, especially when they played good songs like Super Freak and Whip It, but I caught myself thinking too much. Am I doing that one move too much? Where is the camera? Is my lipstick smearing? I’m starting to sweat, is my face getting shiny? It’s so hot in here! I suppose that just like anything else, loosening up enough to dance on TV with abandon takes practice. But, I did it, and I’m proud of myself. Thanks for dancing with me, Mom. Can’t wait for our big “premiere” next week!